作者: The AsiaN Editor on 26 January , 2017. This year the Republic of Korea and Uzbekistan celebrate the 25th Anniversary of the establishment of diplomatic relations. The foundation of bilateral relations between the two nations was laid on Dec. 30, 1991, when South Korea was among the first foreign countries to recognize Uzbekistan’s independence. Subsequently, diplomatic relations were established on Jan. 29, 1992. Ever since, the two countries have engaged in vigorous cooperation in all areas. The intensity of close collaboration can be manifested by the fact that over the past 25 years there have been fourteen summit meetings between heads of state. Within a short period of time Seoul and Tashkent have gained enormous experience of mutually beneficial cooperation in political, trade-economic, investment and cultural-humanitarian areas that serves as a solid foundation for the further implementation of long-term joint projects in various spheres. In March 2006 the two countries signed the Joint Declaration on Strategic Partnership that greatly contributed to furthering and strengthening multifaceted Uzbek-Korean relations and elevated them to a new qualitative level. In general, over the 25 years of diplomatic relations, a solid legal basis for bilateral cooperation has been laid which today encompasses more than 200 documents that streamline collaboration in different fields which further diversified Uzbek-Korean relations and filled them with practical content of strategic partnership between the two nations. In further advancing and deepening bilateral cooperation, regular dialogue between the leaders of the two countries that has become one of the hallmarks of Uzbek-Korean bilateral relations, played an important role. For the past three years there have been two summit meetings between the two countries’ Heads of State, where a wide range of bilateral and regional issues have been thoroughly discussed and perspective areas of collaboration identified. In 2014 the leaders of the two countries signed the “Joint Declaration between the Republic of Uzbekistan and the Republic of Korea on the further development and deepening of the strategic partnership” that defines perspective directions for cooperation in political, trade-economic, investment, cultural-humanitarian areas as well as collaboration in the framework of international organizations. The Uzbek side reaffirmed its strong support for a pacific, well-thought-out and balanced foreign policy of the Republic of Korea aimed at ensuring peace and security on the Korean Peninsula and in the region as a whole. Given the high level of cooperation between the two countries in the age of globalization, Tashkent recognizes the “Eurasian Initiative” as an important initiative, considering its crucial role in reviving the ancient Great Silk Road in a new modern reality. The parties share the same view of necessity of linking this project with other existing international and sub-regional programs of economic cooperation and development of transport-communication systems. The Republic of Korea showed its heartfelt sympathy during a difficult time for the Uzbekistan people after the demise last September of the First President of Uzbekistan Mr. Islam Karimov who greatly contributed to laying a solid foundation for multifaceted cooperation with the Republic of Korea. On Dec. 4, 2016 Prime Minister Shavkat Mirziyoyev was elected President who continued the policy of advancing close and mutually beneficial relations with Korea. On Jan. 5, 2017 President Mirziyoyev and South Korea’s acting president, Prime Minister Hwang Kyo-ahn had a phone conversation and voiced hopes for close bilateral cooperation to cement the two countries’ strategic partnership. The Parties have achieved notable success in the area of promoting inter-parliamentary cooperation. In 1995, in the National Assembly of the Republic of Korea a Parliamentary Association of Friendship “Korea-Uzbekistan” was founded. In 2005, in the Legislative Chamber of the Oliy Majlis of the Republic of Uzbekistan a similar group for cooperation with Korea was established. These institutions play an important role in furthering inter-parliamentary collaboration and supporting the overall process of strengthening the bilateral relations. Since 1995 the Foreign Ministries of the two countries have been holding their political consultations on a regular basis. The last round of consultations took place in December 2015 in Tashkent where the parties discussed various aspects of bilateral cooperation and exchanged views on important international and regional issues that are of mutual interest. Since 2007 a Forum “Republic of Korea ¬ Central Asia” has been annually convened. Its primary purpose is to strengthen and expand cooperation in the area of economy, culture, education, tourism as well as to share experiences in the fields of information-telecommunication technology, construction and transportation. In order to increase efficacy of the Forum’s activity, Uzbekistan has supported a Korean initiative to establish its Secretariat. During the 10th meeting of the Forum held last November in Seoul, the participants announced the creation of the Secretariat which will be officially launched this coming July. 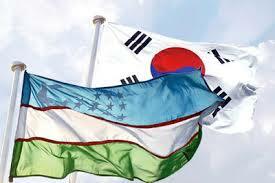 Today Korea is among the most important economic and investment partners of Uzbekistan. Over the past 10 years the trade turnover between the two countries has increased 4 fold while the total volume of the announced Korean investments into the economy of Uzbekistan exceeded $7 billion. Currently the two countries have been cooperating in implementing a number of big investment projects that give great impetus to deepening cooperation in trade-economic, investment and energy sectors. Last May the construction of the Ustyurt gas-chemical complex on the Surgil deposit was completed. This project worth $4 billion is carried out jointly with KOGAS, Lotte Chemical and other Korean corporations. Uzbekistan is one of the leading countries in the world in terms of reserves of precious, base and rare metals, uranium, natural gas and other fossil fuels. This serves as a solid basis for joint economic and investment collaboration. However, bilateral cooperation is not limited to exploration of natural resources alone. Intensive collaboration is underway in the manufacturing sector, including the automotive industry. There are also myriad opportunities for enhancing investment cooperation in mining, oil-gas, petrochemical, construction and textile industries as well as in the agricultural sector and in the field of energy saving technologies. Today in Uzbekistan there are more than 450 enterprises with the participation of the Korean side. Logistics are another area of cooperation. The world’s largest air-cargo carrier Korean Air for the past six years has been managing an International Logistic Center at the Airport of Navoi that is located next to Navoi Free Industrial Economic Zone which creates exceptional conditions for developing economically viable production and swift delivery of manufactured products to global markets through an effective system of multimodal transportation networks. The two countries have been closely cooperating also in the financial sector. Recently, with EDCF’s preferential loans we have implemented a number of projects in the areas of telecommunication, healthcare and education. Currently projects on establishment of the e-Government Integrated Data Center Project, construction of the New International Passenger Terminal (Tashkent-4) at the Tashkent Airport and creation of a modern multipurpose and highly specialized medical center of fourth level are underway. Intensive bilateral cooperation has been underway for a quite long time thanks to technical assistance of the Government of the Republic of Korea that is rendered through the Korean Agency for International Cooperation. As of today more than 1700 specialists of different ministries and agencies of Uzbekistan have undergone trainings in South Korea through KOICA’s programs. The two countries have been successfully cooperating for an extended period of time in the cultural-humanitarian field, in particular in expanding exchanges and interactions in the area of education, tourism and sport. One of the concrete results of such collaboration is the creation in the capital of Uzbekistan, Tashkent, of the Seoul Park that quickly became one of the popular places to visit by the people and guests of Tashkent. The Korean Diaspora in Uzbekistan, one of the largest in the world, plays an important role in strengthening friendly relations between our two countries. In 2014 the two countries signed a Memorandum of understanding on the creation of the House of Korean Culture and Art in Tashkent. Among main purposes of this House is the creation of favorable conditions for preserving cultural heritage, traditions and art of Uzbekistan’s Korean Diaspora. This year the Korean diaspora will celebrate the 80th Anniversary of their residing on the hospitable Uzbek soil that became their second motherland. All-in-all, over the past 25 years since the establishment of diplomatic relations Tashkent and Seoul have forged a genuine strategic partnership and currently are closely cooperating with each other in further advancing multifaceted cooperation in various fields and strengthening mutually beneficial bilateral relations that serve the interest of the two countries and their peoples.